I do preliminary sketches of all the panels before having Obfuscobble draw the final product. The result is that I got to experience the horror of trying to draw a robot piledriving somebody before I forced another human being to do so. I remember working on last chapter, saying to myself a few times "If I ever make a scene this complicated again, I'm gouging my own eyes out"
I think somebody last page asked for this image with no text, so... there it is. Oh please be a First. HA HA. Now I see why people love calling it! I sense that either the Pink bob-omb is going to be epic... or he's going to be detonated, and Guy is going to go on a hell bent revenge and rip King bob omb apart one nut and bolt and wire at a time. Guy and Pink Bob-omb to the rescue! I agree. I've said before that I wish Morg had a "sketchbook" section, for not only his rough drafts, but also a few doodles and out-of-character MG exploits. Nothing regular, just for fun and so the fans can see Morg style again. Poor Palma. She got pile driven upside down by a sentient bomb while hanging from a rope. It seems guy's made a new friend. what exactly is holding palma's suddenly bungee-like rope? Dear god..... This king Bob-bomb...I shall call him.... Mike Haggard. I was the first to compare KBB to Mike Haggar, and to see him using his signature move is simply awesome. On another side, I'm a bit concerned about Palma. If Guy ever stops being voiceless, the first thing he should say is "Where's Smithy!?" Made an account and subscribed to show my massive thanks for the picture... honestly I kind of thought nobody saw that post because I didn't get any responses. I've got to figure out something that actually is worth it because just subscribing feels like the cheap way out. Anyone have any ideas? She'll be fine though, right guys? Just gonna brush it off? Yeah, she'll most likely be gone for a while, but be back soon. "To kill your enemy, you want to look in his eyes so that he knows that you're the one who beat him to death! It also give you a chance to deliver some really zippy one liners. Like, 'I hope you brought your wallet, 'cause the rent in Hell gets paid in advance!' and my personal favorite, 'You just got Sarged.'" The above comment looks like a puma. Well your comment looks like a tasty lead sandwich with a side of Sarge! Hold the life and the Mayo. What's that Mexican lizard that eats all the sheep? Yeah! Hey, Grif, Chupa-thangie! How bout that? I'm not quite following your train of thought, MeowMix. What are you talking about? @ Evdog Dude where do you find this stuff?? ....Never mind, I don't want to know. That's a quote? From what? Never mind, I get it now. Dude! You didn't know what the quote was and you said Chupacabra? ....I want you to guess what number I'm thinking of. It's between negative thirty and a bijillion. But the Cupacabra IS a lizard thing. Its more well know for eating goats, but sheep are pretty much the same thing. But I'm willing to risk it! Am I the only one who's actually just excited to see Guy on an auto-bomb. Seriously. You think you'd see more shyguys on them in comics... but this is the first time I have. Hmmn... 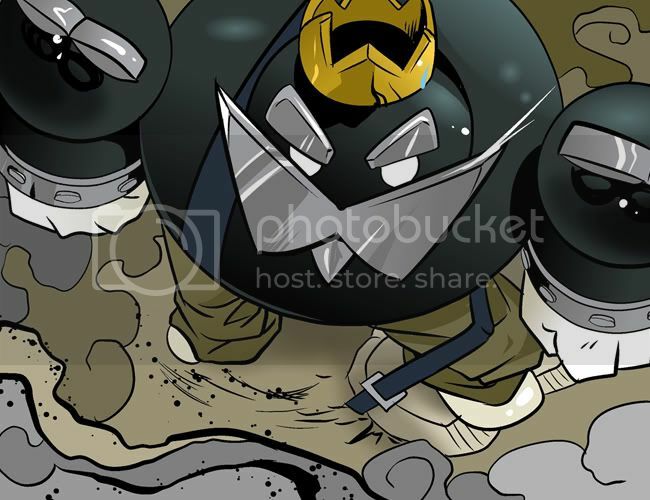 I love this comic so far, the Bomb-ombs are the only depiction I haven't liked, since they're regularly shown to explode and be fine later in some of the games. And what about Bombette or Bobbery? Do they not exist in the Go-Universe of the comic? Or were they just higher end models that got free will and such? I treat the ability to reform (what I assume is some sort of magnetic, break apart "smart shell") as something rarely implemented in the older models, probably an experimental system until the newer Bob-ombs rolled out. Most of the "generic" Bob-ombs through the Mario games don't seem to reform; however, the ones that developed more sophisticated AI on their own (and thus were made of higher end parts, and were more advanced, possibly experimental stage Bob-ombs) seemed to have it more frequently, so I assume it was an aspect of the higher end tech that didn't get used as much--probably due to the costs involved of building them. Bobbery in particular seemed like a definite case of a Bob-omb built with experimental tech, since in addition to being reformable AND having really advanced AI, he was closer to a dull gold color than the normal black/blue/purple, or even pink Bob-ombs. Really, a great number of Bob-omb "generations" can be traced back through the games. From the ones that just idly wandered back and forth in MB3, to the ones that actively chase Mario in SM64--plus the off-shoots, like Booster's Rob-ombs and those digital clock looking bombs in Sunshine. It's likely the Koopas are trying to work the "bugs" out of the reformation system, probably as part of the whole "We need them smart, but not too smart" problem. @. @ You are brilliant sirrah. Tell me, have you ever gotten into contact with this fellow? I think you should. Forgive me if you already are, or it's been mentioned before. Been reading Mushroom Go for a while, and just wanted to say - as someone who's been playing Mario games for a long time, you do this epic. Heck, a lot of your canon actually justifies some of the nonsense decisions, connections, and transitions.